Have you said “I do” to a spring 2019 wedding? If so, you’re probably beginning to plan and prepare. You want the big day to be personal to you, but also modern, incorporating your favorite of-the-moment wedding ideas. As your nuptials draw closer, take a look at 5 trends to try for your spring 2019 wedding. The wedding gowns designers showcased for spring 2019 featured bold silhouettes. As you shop for your perfect dress, look for a gown that makes a major statement. Directional silhouettes, interesting lines, and unexpected angles are all having their moment in 2019. Whether they’re huge three-dimensional blooms at your hip, full-body floral lace, or embroidered flowers on your train, flowers are in for spring 2019. We’re seeing them big and beautiful on dresses for this season, so don’t be afraid to celebrate your love of all things floral. During the 70’s, people reveled in bright, vivid hues like purple, orange, and canary yellow. We’re seeing a comeback for these colors, but with a little modern twist. Check out shades like periwinkle, peach, and violet, as well as bright hues paired with pastels for balance. Another color trend? Throwing the old rules out the window. Spring palettes are no longer limited to traditional spring hues like faint pink, sky blue, light yellow, or pale green, and autumn isn’t tied to richer hues any more. Now you can show the love for those deeper, heartier hues any time of the year, as long as you bring in balance with a complementary tone. 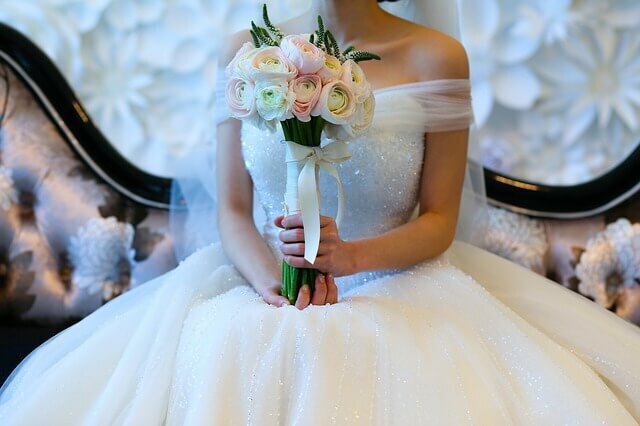 Look for technology to play a huge role in spring 2019 weddings. Video mapping is catching on as it becomes more affordable; and with it, couples with be able to add extra interest and decor details to event spaces. Just ensure your photographer is licensed to fly, to avoid a collision or the possible injury of a guest. Photography and videography also take on a modern twist with the use of drones. With a drone, you can get unique photography angles for truly memorable shots. Ask your photographer or video expert if using drone photography and video capture is a possibility for your wedding. Even as technology takes a leap forward, keep in mind that unplugged ceremonies are also becoming more popular. Consider having a wedding ceremony free from digital distraction. You can always allow your guests to take out their phones later, at the reception. If you’re eager to have the perfect blend of on-trend and traditional at your wedding, check in with our event specialists at Nanina’s in the Park. They’ll be happy to offer guidance and ideas that can shape your big day into the perfect experience for you. And if you haven’t taken a tour of Nanina’s in the Park yet, be sure to stop by and enjoy the beauty of our grounds and interior spaces, perfect for your spring 2019 wedding.